Wreckage from a plane carrying Cardiff City footballer Emiliano Sala has been discovered in the English Channel. The Piper Malibu N264DB was lost on 21 January on its way from Nantes, France to Cardiff, with the Argentine striker and pilot David Ibbotson on board. David Mearns, who directed a privately-funded search operation on behalf of the Sala family, said the wreckage was located off Guernsey on Sunday morning. The Air Accident Investigation Branch are at the site to recover the plane. Cardiff had signed Sala for a club record of £15m and he was due to start training last month. The 28-year-old player and Mr Ibbotson, 59, from Crowle, North Lincolnshire, were travelling from Nantes, where he had previously played, when the flight lost contact with air traffic controllers. An official search operation was called off on 24 January after Guernsey’s harbour master said the chances of survival were “extremely remote”. Cushions believed to be from the plane were found on a beach near Surtainville, on France’s Cotentin Peninsula, last week. 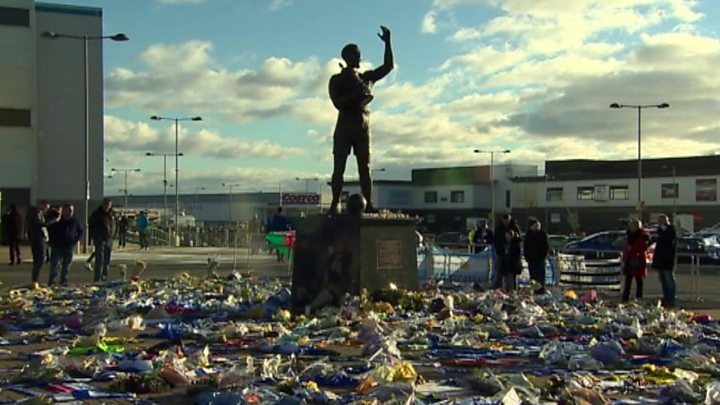 There were emotional tributes to the footballer as Cardiff played their first home game since the disappearance earlier on Saturday. An online appeal had raised £324,000 for the private search, which began on Sunday. Working jointly with the AAIB, Mr Mearns’ ship and another search vessel, the Geo Ocean III, began combing a four square mile area of the channel, 24 nautical miles north of Guernsey. Mr Mearns had said the AAIB had a “high confidence level” that the plane would be found in the area they were searching. The AAIB ship has remained at the site where the missing Piper plane was located, to deploy an underwater search vehicle to make a visual confirmation. A recovery operation will then begin. Officials at the AAIB said they expected to give an update on the operation on Monday morning.